Because mollusks build shells of calcium carbonate, they are at particular risk from ocean and coastal acidification (OCA). Mollusks are a large group of invertebrates that includes bivalves such as scallops, mussels, and oysters; gastropods such as snails and sea slugs; cephalopods such as squid and octopi; and many other species. A number of studies have investigated the effects of OCA on bivalve species that occur in New England, although they have not all used individuals sourced from this region. The studies have found that all but the ocean quahog (Artica islandica) are negatively affected, exhibiting slowed shell growth and/or calcification, sometimes across multiple life stages. The research shows that the youngest life stages, or larvae, are especially vulnerable. 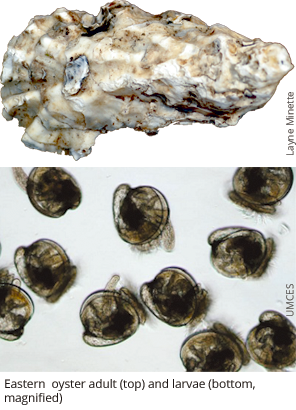 While most juvenile and adult bivalves in this region seem capable of surviving OCA until it reaches extreme levels (pCO2 > 3,500 μatm), the larval stages are highly sensitive. In effect, OCA can cause the shells of tiny clams and other bivalves to disssolve or to not form at all. Such extreme levels routinely occur already, particularly within urbanized estuaries, and represent waters undersaturated with respect to aragonite, meaning Ωarag less than 1.0. Specifically, larval stages of the hard clam (Mercenaria mercenaria), eastern oyster (Crassostrea virginica), and bay scallop (Argopecten irradians) show elevated mortality at moderate-to-high levels of CO2 (750–1,500 μatm pCO2). Further, larvae that do manage to survive high CO2 (low Ωarag) exposure are smaller and generally less fit, life-history characteristics that would likely translate into high mortality rates as they become early-stage juveniles (Marshall et al., 2003). The high sensitivity of larvae to OCA could represent a bottleneck for individuals exposed to this stressor (Schneider et al., 2003). This individual effect could translate into declines in population size in species in which population dynamics are strongly influenced by larval survival. Similarly, low biological sensitivity in adults can also translate into population-level effects for long-lived species in which population dynamics are strongly dependent on adult survival.